Many moons ago, I took a challenge. I chose to spend a week eating on a SNAP budget (and my husband was forced to participate by default). We learned a lot that week. We had to get pretty creative to make our money stretch for the whole week and still find nutritious food to keep us going for the week. 1. We would be eating a lot of oatmeal for breakfast. 2. I would be making lentil soup. Eating lots of oatmeal wasn’t a challenge for me. I happen to love oatmeal. And I enjoy all kinds of soups. 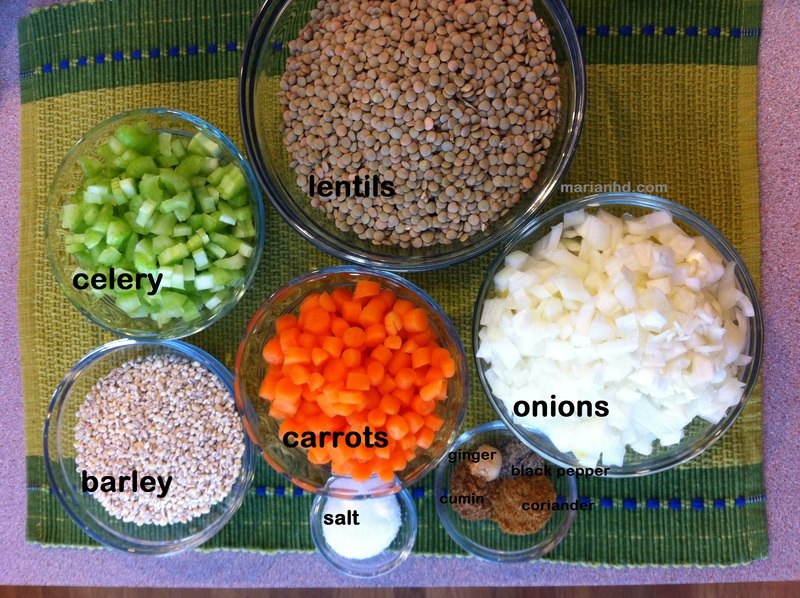 I googled for a solid lentil soup recipe to base my SNAP soup on, and I found Alton Brown’s version. Alton is always a trustworthy source. I did have to find a substitute for grains of paradise, which my local Kroger doesn’t happen to stock. Ginger and black pepper does the trick for me. 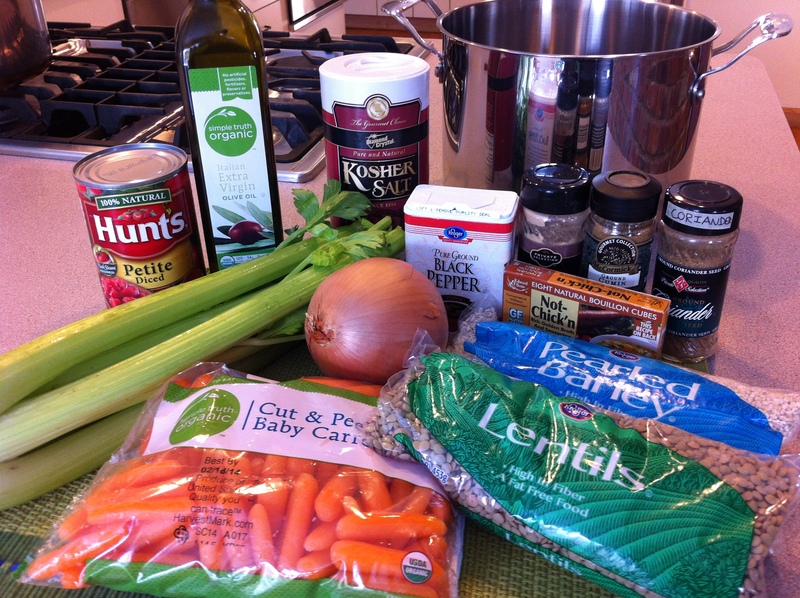 The foundation of this soup is made from very inexpensive basics, which makes it great for anyone on a budget. It’s delicious, too, so it’s good for anyone who likes to eat delicious food. Given that it’s winter, I had a craving for lentil soup this week. To “beef” the soup up a bit, I decided to add some barley. It was a good choice. It even passed the judgement of a group of foodies–the board of the local farmers’ market! If you’re an organized person, chop your veggies ahead of time, and the soup will come together pretty quickly and will just need time to sit and simmer while you throw together a salad, play with your kids, take a power nap, or mix up some amazing cocktails. If you aren’t organized, you could likely use a frozen bag of mirepiox to minimize your prep time. Everything else is shelf-stable, which makes this an easy soup to be able to throw together when the fridge is getting empty. 1. Chop the onion, carrots, and celery. Heat the oil in a large pot. Once it’s hot, add the veggies and the salt. Sweat the onions for about 6-7 minutes, until they are translucent. This is an important step to build excellent flavor in the soup! 2. Add the lentils, tomatoes, broth, barley, and spices. Stir and bring the soup to a boil. Reduce the heat to low and simmer the soup for 40-45 minutes, or until the lentils and barley are tender. 3. If you like, you can puree part of the soup to give it a thicker texture. Me too! What’s your favorite? 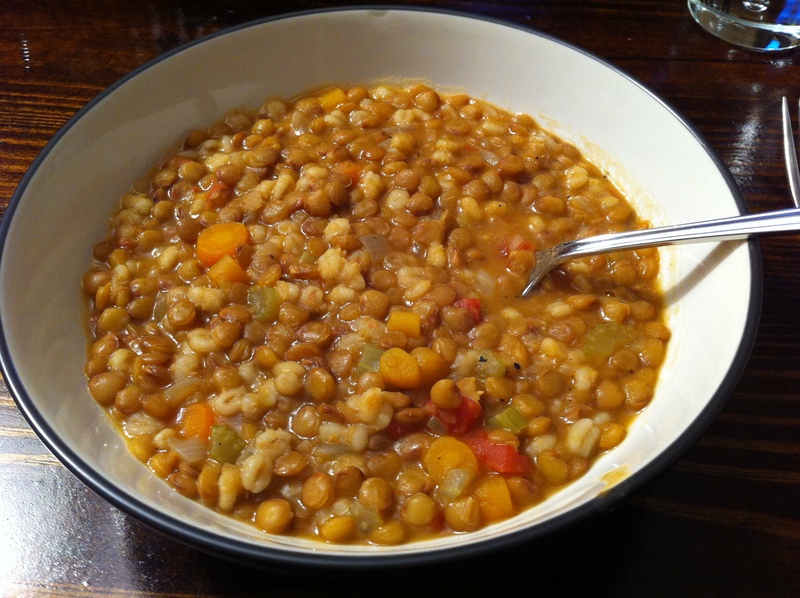 There’s something just so happy about a hearty bowl of soup and lentil is one of my favorites. I usually make it based off a very simple recipe from culinary school — equal parts very finely diced carrots, fennel and shallots. Add lentils, thyme springs and veg stock and cook until tender. It’s super good but yours looks tasty enough to tempt me into trying something new! I’m tempted to try yours! I’m a new fan of fennel and I’m always excited to find a new way to try it. In lentil soup sounds perfect! Thank you for sharing!